I have the opportunity to make a mural-sized print in my B&W class. By mural I mean 3 ft by 3 ft (1 m x 1 m). chemicals is so labour intensive. However, our instructor Canadian-born Brian Young, is willing to let us try. The dilemma is which negative to print. 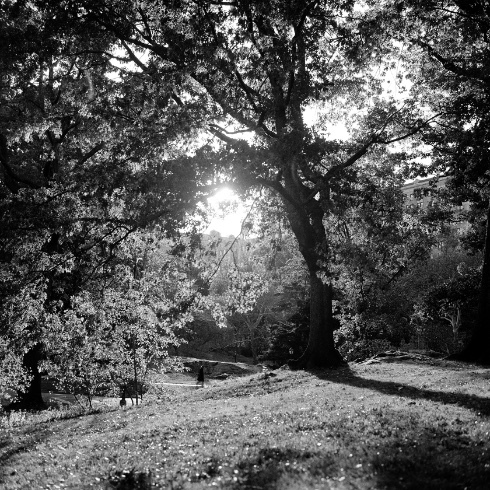 The tree in Central Park (left)? The tourists on the park bench (right)? Maybe one of the dogs from from my Quirky Canine project (Feb. 5 post)? Your input is appreciated. Kirsten Murphy - Jason (AKA 57th Street Gang). Of course that is helpful. Tourists on a Bench lead at this point. Don Babey - I don't generally like photos with people in them, but the park picture is not NYC specific, so I vote for the people pic. Shouldn't Chester and Bindi get a vote too, since it might be hanging in their space? Squid - Well like I said , tough decision. Just kinda think the tourist one is kinda different and a conversation piece. As always both would be good additions to the 57 street facilities. Not much help am I.
Kirsten Murphy - I love it too. And the little person frozen in time. Kirsten Murphy - There is a good change the chosen print will hang on a wall at 5023 57th Street. Knowing this, do you want to change your selection? Squid - Well, that's a tough question. I love both of them. However, since the one on the right with the tourists has the word beer behind them on the wall that one it is. The other reason is that the word Lucy's is on the wall to the right on the neon sign. Just kinda seems like a slice of life in NYC. Keep up the great work.